Ross Design™ & Engineering, Inc. has manufactured forks for forklift trucks for over 20 years. Lengths of standard forks manufactured range from 32″ to 144″ (3′ to 12′ in overall length). 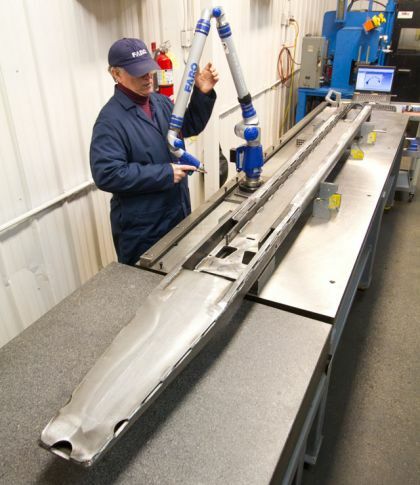 Ross has also fabricated one of the industry’s largest ever formed forks being 17′ in overall length. Forks are 100% manufactured in house at Ross Design™ beginning with the processing of raw material into flat pattern blanks, heavy tonnage forming, various machining processes, and the fabrication of required structural sub-components. Multiple fabrication lines are available for the processing of fabricated forks, each with required support equipment such as Overhead JIB cranes and in-process roller systems for the handling of large components. Weld workmanship of Ross Forks are at the forefront of the industry, complying with AWS quality standards, lead by our on staff AWS certified Weld Instructor. Completed weldments are also inspected with our 12′ Faro CMM arm to verify dimensional integrity and ensure continuous quality improvements.